In many ways, authenticity is everybody’s darling: the historian searches for authentic, historic texts in order to write down history objectively; the readers, naturally, appreciate an authentic description of the past; and museum visitors want to see authentic originals, not replicas (Franz 2011, 335; Meiners 2008, 169; Saupe 2010, 185). However, when relics are integrated in a complete surrounding of houses, animals, family life and artistry represented by adequately dressed people, they can be a real attraction (van Norden 2011b, 67; Schwarz 2010, 234f, 237). Neurology explains why that authenticity is so effective: memory is improved by experiencing something with all your senses and in an emotional way (Duisberg 2008, 96; Faber 2008, 133; Pampel 2011, 56). Visitors who smell the smoke of the fireplace in a Rössener house and touch its rough beams feel as though they have travelled back in time and may feel as though they can see with eyes of Stone Age farmers. Visitors are able to leave the present, which in many ways can be confusing, and enter a new cosy ‘pastness’ (Hochbruck 2008, 45; Faber 2008, 117; Schwarz 2010, 240). The historian is obliged to uncover his interest, the questions which guide his investigation, his sources, his theories and methods to enable readers to question his results in order to find their own position. History is a way out which compensates for every day problems (Klein 2011, 123; van Norden 2012a). Re-enactors measure the quality of their voyage back in time by the authenticity of their outfit in terms of material and production (Apel 2008, 103). They perhaps feel the same as those visitors, who sometimes are their audience, but they are experts on mimicry (Vahnenbruck 2008, 160). Teachers are keen on authentic objects and sites because they have such an emotional impact on pupils and help them to learn about the past (Kircher 2010, 43; Schönert 2011, 283ff.). People responsible for a museum may try to attract visitors by satisfying their expectations of authenticity because the entrance fee is an important financial factor (Sénéchau 2010, 104). On the other hand, authenticity also seems to guarantee a scientific standard and authority; and to make the difference between museums and fun parks (Faber 2008, 130; Meiners 2008, 170). Only by telling the truth can museums, re-enactors and historians achieve their educational mission properly. Discussion about historical exhibitions, Living History performance, buildings in open-air museums and historiography generally focus on authenticity. Authenticity is obvious, is it not? There are three things whose authenticity is seldom questioned: the relic, the historic place and the contemporary witness (Bromberger 2011, 158; Christmeier 2011, 307; Dietzel 2011, 81; Pollak 2011, 239, 244; Rüsen 2001, 232; Stec 2011, 203). The part of historiography in this competition of the authentic is far more difficult, because it depends on historic texts. Obviously the historic author described what had happened from their point of view and was guided by their intentions towards the addressee. Therefore the text is not a reproduction, but an interpretation of the things or events it refers to. Furthermore, this historic text, which has been chosen by the historian for investigation, is not authentic in terms of mirroring the past. Textual sources are authentic to the extent that they were produced at a certain time by a certain author. The relation between the issue, its interpretation and its representation as a text has a semiotic, not a mimetic, character. This applies to historiography as well, which is the representation of the historian’s interpretation of some historic texts. The hermeneutic of the texts, those sources which form part of some kind of communication, always depend on attitudes and intentions. Telling what has happened in the past, historiography cannot be authentic, but it can be trustworthy if it is coherent in its argumentation, the sources it depends on, and in the judgement of other historians. The grade of narrative, empiric and consensual cogency makes the difference between scientific historiography and historical novel, but we cannot rely on categories like authenticity, objectivity or truth. This is relevant to dealing with contemporary witnesses as well, because their memory is as subjective as any historic text and changes permanently according to the situation it is activated in. This has been shown convincingly by Johannes Fried (2004). 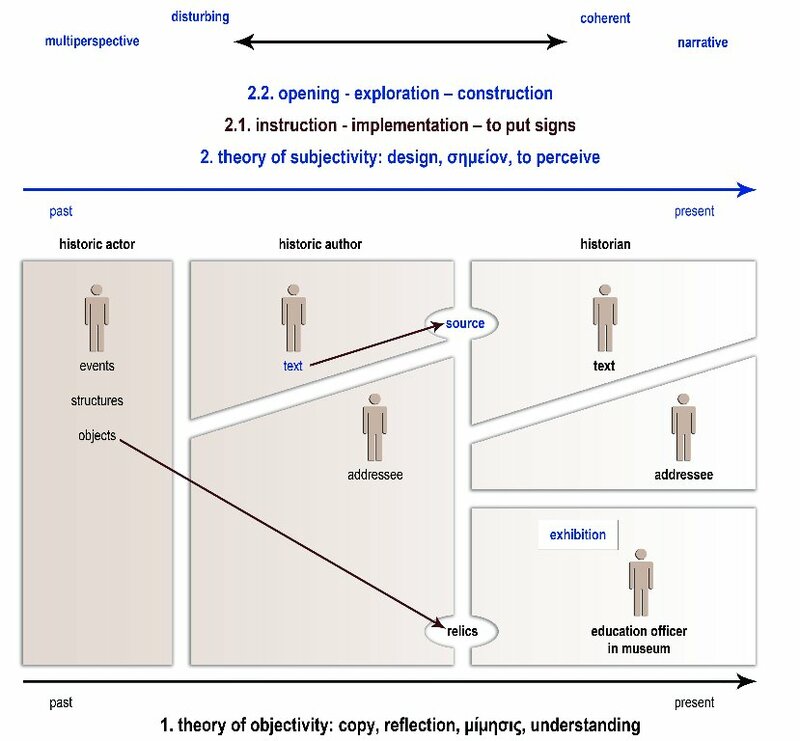 Constructivist hermeneutic may be contested by followers of positivistic objectivism, however I have discussed this in previous publications (van Norden 2009, 2011a, 2011b, 2012a, 2012b). This article concentrates on material sources exhumed by archaeologists, such as bifaces, crocks and other tools, which are then displayed in museums because at first sight they do not carry either points of view or intentions as they are not embedded in communication. Those sources are authentic traces of the past we can see here and now, so we cannot judge their constructions so easily. Museums are the guardians of authenticity as well as certain sites where we can localise historic events by, for example, archaeological methods. But first of all it is necessary to define what ‘authenticity’ and ‘authentic’ really mean to get a firm basis for discussion. ‘Authenticity’ originates from the Grecian adjective αὺτός which means itself, alone, the same (Gemoll Nd . 1979, 142). According to its origin, authentic generally stands for ‘true’, ‘real’, ‘objective’, ‘original’ (Richter 2010, 47; Schläppi 2010, 252). So an authentic object is the opposite of a copy or a fake. It was created by some ancient craftsman a long time ago functioning within a specific setting while used by competent persons. So authentic objects are characterised by a unity of time, place and action, criteria which do not match the texts, which arise looking back to the events they describe. Kant spoke of the ‘Ding an sich’ (the thing as it is) to make sure that no subjective attitudes intervene (Kant 1979, 24). So the ‘things as they are’ form the world of ontological realism (Kistenfeger 2011, 153). They promise time travel, they seem to help us to look back and catch how human life has been. Objectivism states that we can recognise the things as they have been and have been used. Getting closer, disappointment grows and we must accept, that the past is not a country we can travel to, neither a foreign one (Lowenthal 1985). First let us look at the time some tool- the later relic- is produced and used. The biface belongs to the Stone Age for example and must be integrated in its economic, social and cultural context. Considering contextualisation the ‘Ding an sich’ is only theory. Kant and the sociology of knowledge made it quite clear that in real life there are only ´things for us` (Berger/Luckmann 1969). Objects’ value depends on supply and demand, technical skills and the circumstances of production, but also on esteem emerging from ownership. And if context changes, practical, economical and spiritual values are changing too. Suddenly an object is part of communication. For example in German ‘jemandem einen Korb geben’ means ‘to give a basket to someone’ but also to reject a proposal of marriage. If you find an empty basket at your door leaving the house in the morning it might be the sign that the person you adore does not want you. So we have to add a lot of cultural connotations to material objects to catch their relevance. This is not so difficult for us concerning the objects produced and used in our lifetime, but there are times where we cannot understand why some ugly heirlooms are so precious for others. It is because added connotation sometimes is very personal and hermetic. Secondly, material authenticity itself changes over time. The used object is not the new one. It suffers from cultural change of value and function as well as from material abrasion, decay and erosion. Therefore the object cannot be authentic after leaving its original time, place and function. It might become useless and loose its values. Centuries later archaeologists may examine a waste dump and excavate objects thrown away as worthless, but which now have a new, scientific value. They find only between one and ten per cent of those objects used by our ancestors and therefore have to invest a lot of imagination into the relics to make them a history. Consequently the third step is the recontextualisation of the material object found. As time passes it changes, and this implicates free space for new connotations as the old ones are lost and gone forever. In vain, the restoration of broken or damaged relicts tries to put the clock back. When repairing an old machine you may need new material such as new spare parts if there are no original ones left. This means the restored exhibit is not completely authentic. In the discussion about memorial sites and memorial education controversy arises from the question: how and to what extent is restoration possible without reducing objects authenticity? Jörn Rüsen, for example, claims that the signs of decay in concentration camps should, to a certain extent, remain to keep its authenticity (Rüsen 2001, 186). The re-enactors who impersonate Viking warriors must recreate all their equipment and, when they are acting, they stick to their own time staying the same person. Apart from mental structures and feelings there are also enormous differences in health status and body height for example (Walz 2008, 32). Open-air museums with their exhibition of houses from Stone Age up to early Middle Ages like Oerlinghausen are places of scientific creation, but their construction of ‘pastness’ responds not only to science but also to contemporary health and safety standards (van Norden 2011b, 67f; Walz 2008, 32). Open-air museums are the result of various factors, they cannot reconstruct the past. In Oerlinghausen for example, traces of prehistoric buildings were found, and the first Germanendorf was constructed nearby so as not to destroy them. It was created in 1936, and so was influenced both by Nazi ideology and archaeological science. The ‘Führerhaus’ combined a wooden construction and a concrete floor, the last achievement of building trade, to make it attractive to visitors and make them dream of living in similar houses in the vast lowlands of Russia, which were waiting to be conquered. Another part of that Aryan culture of pride was the furniture inside: the living room was crowded with exhibits taken from various centuries to produce a feeling of rural cosiness. After World War II Oerlinghausen was sold and demolished. However, it was rebuilt in the same fashion in the sixties by local survivors who had cooperated before liberation of Germany from the Nazis. This problematic situation was not addressed until the nineteen eighties, when Martin Schmidt and his successor Karl Banghard took over (Banghard 2006, 22-25; van Norden 2011b, 69f. ; Schmidt 1999, 152). Recontextualisation and reconnotation are necessary to get in touch with historical sites. Historiography, living history, exhibitions, museums and memorial sites are constructions (Garnitschnig 2011, 67; Stec 2011, 195; Zülsdorf 2011, 172). They have that symbolic character indispensable for communication, they are texts. Both historical places and relics are voiceless. Torn out of their original context, they do not make sense themselves, and only act to narrow down our imagination of the past just a bit. So the models of Rössenerhaus you find in today’s museums can differ a lot, and you can distinguish various types, for example the rural type of the seventies and the more sophisticated type of the present which do not look like a barn but a colourful Polynesian aisled house (Schmidt 1999, 154). Integrating relicts into an exhibition is a first step towards its recontextualisation. Whether the visitor judges what they see as authentic depends on their own criteria (Christmeier 2011, 318). They can follow their own imagination, and the relic, bared of its original connotations, opens up a great number possibilities to do so. Museum display presents itself as true and only one because of its scientific character. They might accept the sense the newborn object makes as a part of museum presentation because of her scientific authority. Its authority needs to derive from narrative, empiric and consensual cogency without denying that it is only one constructive solution within a wide range of alternatives. Cogent recontextualisation and 'reconnotation' is a creative process. Its product is a narration, because it connects present and past (Rüsen 1997, S. 57-63). It should invite to its own deconstruction by showing the way it was constructed. Cogency guaranties scientific authority without referring to authenticity, but it needs reconstructive elements in re-enactment, in open-air museums, in historic exhibitions and in historiography to allow autonomous learning. Normally the concept of ‘reconstruction’ is used in the objectivistic model to express the mimetic revival of the past. Than Living History would show us how people acted in the Early Middle Ages, the Rössenerhaus in an open-air museum and his ancestor ten thousand years ago would be twins, the relics would guide our imagination in a very close way, so that we see them with the eyes of our forefathers, who used them, and historiography would tell us what has really happened a long time ago. From the objectivistic point of view, they would be authentic. The danger of objectivism is that it tends to impose its knowledge in the name of truth and does not permit learners to go their own way (Neu 2010, 62). If we share the constructivist model, objectivism leads to unacknowledged fiction. Empathy has no place in historic consciousness (van Norden 2011b, 122f.). Emotions may mislead: if your feelings towards a site or object seem valid, you might be convinced that what has caused that emotion is also authentic. 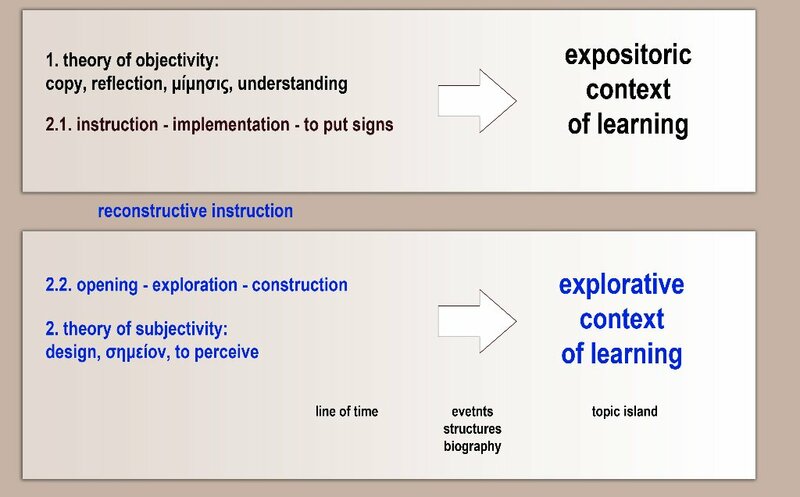 In constructivism reconstruction means to uncover our way of integrating the material relic into new contexts so as to fill the gap which arises from decontexualisation by time passing with our new connotations. The historian is obliged to uncover his interest, the questions which guide his investigation, his sources, his theories and methods to enable readers to question his results in order to find their own position. The re-enactors could offer reconstruction dressing in front of their audience. Additionally a moderator could explain what happens during the scene, or the play may be interrupted to discuss the spectacle and the decisions that were made while writing the script (Duisberg 2008, 93; Faber 2008, 121). In the open-air museum Detmold the actors wear modern cloths when they play the situation of a nineteenth century family who plans to emigrate to USA. What the actors say and do derives from authentic letters from that period. The stage is an old farmhouse some of whose former inhabitants had emigrated . Spectators may identify with the actors and forget time and place but are reminded again and again were they are. The modern clothes work as stumbling blocks, and do not allow for easy-going reception. The open-air museum dedicated to the Stone Age can show the process of how and when its Rössenerhaus was built; the decision making, the craftsmen and the companies who worked on it; the material used and its price; the service of the architect and the structural engineer. In addition it can present different models, different constructions that refer to the same excavation. Karl Banghart, the current director of Oerlinghausen, is intending a more ambitious reconstruction. He wants to divide the ‘Führerhaus’ lengthwise with a glass panel... Additionally one half will be furnished as it was under Nazism, which is documented in contemporary newspapers celebrating its opening, and the other half based on modern archaeological knowledge, with the history of the house written on the dividing panel. In exhibitions you must say something about their preparation. Reconstruction frees the addressee to autonomy. He will enjoy it, because perturbation by stumbling blocks makes his experiences more colourful and interesting. Breaking with his traditional ways of perception, integrating new impressions into his mental structures, or like Piaget expressed it, not by assimilation but by accommodation, he will learn better and more sustainable (van Norden 2011b, 38-46, 150-155). 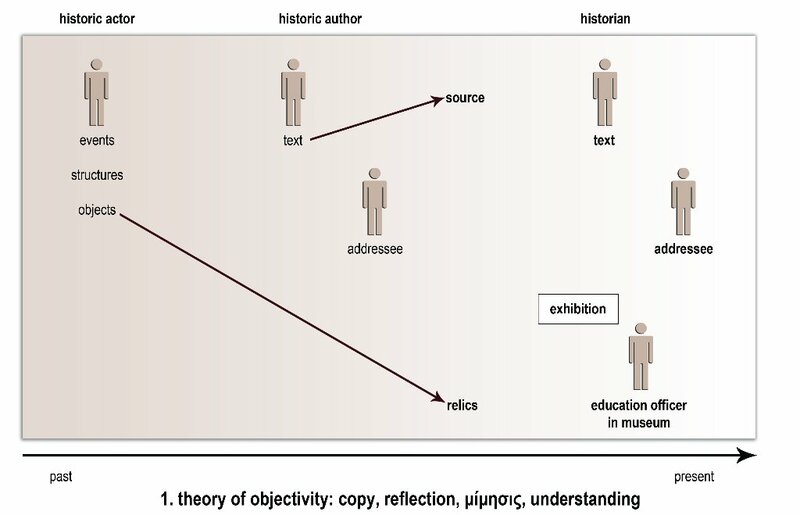 Authors of historiography and museums have to accept the challenge to reduce their authority by reconstructional transparency. They do not give final answers but show how they scientifically attempted to approach the past as it might have been (Klöffler 2008, 135). So let us not forget that authenticity beyond its material physical nucleus is nothing but fiction. APEL, Gefion 2008: „Vivat tempus“ oder Geschichte und Alltagskultur als Abenteuer im Freilichtmuseum? Chancen und Risiken personaler Vermittlung im LWL-Freilichtmuseum Detmold. In: Carstensen, Living History im Museum, S. 101-115. BANGHARD, Karl 2006: Archäologisches Freilichtmuseum Oerlinghausen kompakt, Oerlinghausen. Berger, Peter L./ Luckmann, Thomas 1969: Die gesellschaftliche Konstruktion der Wirklichkeit. Eine Theorie der Wissenssoziologie. Mit einer Einleitung zur deutschen Ausgabe von Helmuth Plessner. Übersetzt von Monika Plessner, Frankfurt am Main. BROMBERGER, Kathi/Rosendahl, Matthias 2011: Die Gedenkstätte Bautzen als außerschulischer Lernort. Ergebnisse einer empirischen Studie zu Schulklassenbesuchen. In: Pampel, Erschrecken – Mitgefühl – Distanz, S. 147-169. CARSTENSEN, Jan/MEINERS, Uwe/MOHRMANN, Ruth-E. (Hrsg.) 2008: Living History im Museum. Möglichkeiten und Grenzen einer populären Vermittlungsform, Münster/New York/München/Berlin. Christmeier, Martina 2011: Wahrnehmung eines authentischen Ortes. Jugendliche Besucher im Dokumentationszentrum Reichsparteitagsgelände Nürnberg. In: Pampel, Erschrecken – Mitgefühl – Distanz, S. 307-327. DIETZEL, Kerstin 2011: „Man denkt schon darüber nach, wie schrecklich es damals gewesen sein muss und wünscht sich diese Zeit niemals zurück“. Ergebnisse einer Schülerbefragung in der Gedenkstätte Moritzplatz Magdeburg. In: Pampel, Erschrecken – Mitgefühl – Distanz, S. 81-95. DUISBERG, Heike 2008: Gelebte Geschichte 1804. Ein Türöffner in die Vergangenheit. In: Carstensen, Living History im Museum, S. 91-100. FABER, Michael 2008: Living History. Lebendige Geschichte oder Geschichte (er)leben? Möglichkeiten, Methoden und Grenzen am Beispiel des Rheinischen Freilichtmuseums Kommern. In: Carstensen, Living History im Museum, S. 117-133. FRIED, Johannes 2004: Der Schleier der Erinnerung. Grundzüge einer historischen Memorik, München. GARNITSCHNIG, Ines/STERNFELD, Nora 2011: Forschung als Prozess. Überlegungen zu transnationaler Geschichtsvermittlung mit SchülerInnen der postnazistischen Migrationsgesellschaft. In: Pampel, Erschrecken – Mitgefühl – Distanz, S. 59-79. GEMOLL, Wilhelm Nd. 1979: Griechisch-Deutsches Schul- und Handwörterbuch, München/Wien. Hochbruck, Wolfgang 2008: Im Schatten der Maus. Living History und historische Themenparks in den USA. In: Carstensen, Living History im Museum, S. 45-60. KANT, Immanuel 1979: Kritik der reinen Vernunft. Vorrede zur zweiten Ausgabe. (Hrsg.) Raymund Schmidt, Leipzig. KLEIN, Marion 2011: Das Denkmal für die ermordeten Juden Europas in Berlin. Strategien der (Nicht-) Authentisierung von Schülerinnen und Schülern. In: Pampel, Erschrecken – Mitgefühl – Distanz, S. 255-281. KIRCHER, Marco 2010: Babylon & Tutanchamun. Zwei Ausstellungen. Zwei Konzepte. In: Pirker, Echte Geschichte, S. 31-46. KISTENFEGER, Jens 2011: Historische Erkenntnis zwischen Objektivität und Perspektivität. Epistemische Studien. Schriften zur Erkenntnis- und Wissenschaftstheorie, Heusenstamm. KLÖFFLER, Martin 2008: Living History in Museen – Aus der Sicht von Akteuren. In: Carstensen, Living History im Museum, S. 135-150. LOWENTHAL, David 1985: The Past is a Foreign Country. Cambridge, London, New York, New Rochelle, Melbourne, Sydney. MEINERS, Uwe 2008: Verlebendigungsstrategien im Freilichtmuseum. Gedanken über Chancen und Probleme populärer Vermittlungsversuche. In: Carstensen, Living History im Museum, S. 161-174. Neu, Tim 2010: Vom Nachstellen zum Nacherleben? Vormoderne Ritualität im Geschichtsunterricht. In: Pirker, Echte Geschichte, S. 61-73. VAN NORDEN, Jörg 2009: Lob eines narrativen Konstruktivismus. In: Geschichte in Wissenschaft und Unterricht Heft 12, S. 734-741. VAN NORDEN, Jörg 2011: Der narrative Konstruktivismus – Irrweg oder Chance. In: Büttner, Gerhard/Mendl, Hans/Reis, Oliver/Roose, Hanna: Religion lernen. Jahrbuch für konstruktivistische Religionsdidaktik, Band 2 Kirchengeschichte, S. 177-194. VAN NORDEN, Jörg 2011: Was machst du für Geschichten? Didaktik eines narrativen Konstruktivismus, Freiburg. VAN NORDEN, Jörg 2012: Geschichte ist Einstellungssache. In: Zeitschrift für Didaktik der Gesellschaftswissenschaften 1. VAN NORDEN, Jörg 2012: Konstruktivismus als Paradigmenwechsel. In: Verein für Geschichte und Sozialkunde (Hrsg. ): Beiträge zur Historischen Sozialkunde. PAMPEL, Bert 2011: Gedenkstätten als „außerschulische Lernorte“. Theoretische Aspekte - empirische Befund – praktische Herausforderungen. In: Ders., Erschrecken – Mitgefühl – Distanz, S. 11-58. PAMPEL, Bert (Hrsg.) 2011: Erschrecken – Mitgefühl – Distanz. Empirische Befunde über Schülerinnen und Schüler in Gedenkstätten und zeitgeschichtlichen Ausstellungen, Zeitfenster. Beiträge der Stiftung Sächsische Gedenkstätten zur Zeitgeschichte Bd. 8, Leipzig. PIRKER, Eva Ulrike/RÜDIGER, Mark 2010: Authentizitätsfiktionen in populären Geschichtskulturen. Annäherungen. In: Pirker, Echte Geschichte, S. 11-30. PIRKER, Eva Ulrike/RÜDIGER, Mark/KLEIN, Christa/LEIENDEKER, ‚Thorsten/OESTERLE, Carolin/SÉNÉCHEAU, Miriam/UIKE-BORMANN, Michiko (Hrsg.) 2010: Echte Geschichte. Authentizitätsfiktionen in populären Geschichtskulturen, Bielefeld, S. 11-30. POLLAK, Alexander 2011: Die Verknüpfung von historischem Wissen und Reflexion über Menschenrechte. Herausforderung für Gedenkstätten und Schulen. Eine empirische Studie der EU-Grundrechteagentur (FRA). In: Pampel, Erschrecken – Mitleid – Distanz, S. 237-254. RICHTER, Henje 2010: „Ich weiß zwar, dass es kein Original sein muss, aber dennoch …“. Fetischistische Grundlagen der Authentizität musealer Objekte. In: Pirker, Echte Geschichte, S. 47-60. RÜSEN, Jörn 5. Auflage 1997: Historisches Erzählen. In: Ders./Bergmann, Klaus/Fröhlich, Klaus/Kuhn, Annette/Schneider, Gerhard (Hrsg. ): Handbuch der Geschichtsdidaktik, Seelze-Velber, S. 57-63. RÜSEN, Jörn 2001: Zerbrechende Zeit. Über den Sinn der Geschichte, Köln/Weimar/Wien. Saupe, Achim 2010: Effekte des Authentischen im Geschichtskrimi. In: Pirker, Echte Geschichte, S.173-193. SCHLÄPPI, Daniel 2010: Schweiß – neue Traditionen – ehrwürdige Erzähler. Authentisches Erinnern als symbolisches Kapital. In: Pirker, Echte Geschichte, S. 251-267. SCHMIDT, Martin 1999: Reconstruction as ideology. The open air museum at Oerlinghausen - Germany. In: Stone, Peter G./Planel, Philippe G.: The constructed past. Experimental archaeology, education and the public, London/New York, S. 146-156. SCHÖNERT, Volker/WECKWERTH, Susanne 2011: Emotionale Überwältigung durch Inszenierung? Ergebnisse einer Schülerbefragung am Deutschen Hygiene-Museum Dresden in der Ausstellung „Tödliche Medizin. Rassenwahn im Nationalsozialismus“. In: Pampel, Erschrecken – Mitleid – Distanz, S. 283-305. SCHWARZ, Anja 2010: Zirkelschlüsse der Authentizität. Das Erleben von Geschichte in australischen TV-Reenactment Outback House. In: Pirker, Echte Geschichte, S. 233-250. SÉNÉCHEAU, Miriam 2010: Der Fund als Fakt? Zur Rolle und Funktion archäologischer Funde in Dokumentarfilmen. In: Pirker, Echte Geschichte, S. 93-121. STEC, Katarzyna 2011: Die Symbolik und Bedeutung der Gedenkstätte Auschwitz-Birkenau aus der Perspektive jugendlicher polnischer Besucher. In: Pampel, Erschrecken – Mitgefühl – Distanz, S. 193-211. VAHNENBRUCK, Kai 2008: Lebendige Geschichte im Freilandmuseum Bad Windsheim. In: Carstensen, Living History im Museum, S. 151-160. WALZ, Markus 2008: Sehen – Verstehen. Historisches Spiel im Museum zwischen Didaktik und Marketing. In: Carstensen, Living History im Museum, S. 15-43. ZÜLSDORF-KERSTING, Meik 2011: Historisches Lernen in der Gedenkstätte. Zur Stabilität vorgefertigter Geschichtsbilder. In: Pampel, Erschrecken – Mitgefühl – Distanz, S. 171-192.